There's never a dull moment down on Crocodile Street because when you visit Charlie and Lola there's always an adventure to be had. Ring the doorbell at the attraction's entrance and you're to be invited in to come and play. You've arrived just in time for dinner, so why not lend a hand by exploring the kitchen cupboards and seeing what you can find. The big question is will Lola eat her Moonsquirters & Greendrops or will Charlie have to convince her. Oh and make sure there's enough food for Soren Lorensen, as you never know when he might drop in..
Once dinner is over, it's time to get ready for bed, but why just choose one outfit when dressing up is fun too. Help an interactive version of Charlie and Lola try on all sorts of different outfits whilst trying to find their pyjamas. Try on the different items of clothing and the characters will give you their verdict and they'll even let you know when they're ready for bed. But don't head to bed too soon, as there's just time for an around the world trip before bedtime, after all perhaps Lola will be more keen on her Moonsquirters & Greendrops when she's seen where they come from. First stop is Greenland, where it rains Greendrops so much that they've been able to gather them together into a ball pool for you to play in. Then it's off to Mount Fuji via the supermarket under the sea, where the ocean nibbles can be found. 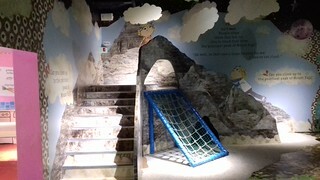 Once you've arrived at Mount Fuji, why not climb the giant indoor climbing frame right up to the sky where you might find some tasty cloud fluff. Phew, after all that Charlie and Lola will be glad you helped them get ready for bed, because they're sure to be worn out. 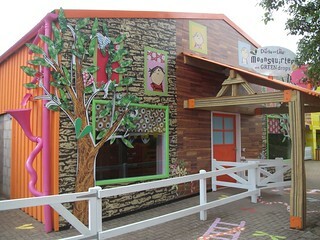 Charlie and Lola's Moonsquirters & Greendrops can be found towards the back of CBeebies Land in the building that previously housed George and Granville, the park's miniature Donkeys.